Paired some Papertrey Ink patterned paper with an Essentials by Ellen Brushstroke Hello word die and one of the flowers from Concord & 9th's Wildflower set. Adhered the clear drops with Ranger gold Stickles. Fast card! MOOD WHEN DONE = Loving daylight savings time! But cute! Nice to have found your blog. LOVE what the gold stickles does under the clear drops! Great card Joan. ps. Did I miss chapter 17? Ha! No, M is still working on her memoirs. Hope to have the next chapter on Sunday! love those colors Joan and the CAS design - not with you on loving daylight savings time - i would like to get rid of it! I love this and I love the stripes! CAS with high style, LOVE!!!! I never think to stamp on top of patterned paper. You've inspired me, Joan. 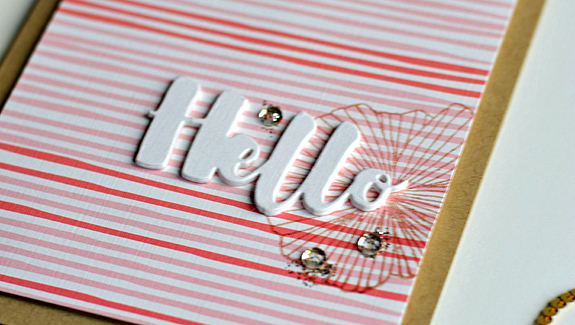 I also love the idea of attaching clear sequins with stickles. Genius!! Oh, I like this so much!